A self-healing cutting mat is made of thin, flexible soft materials. The mat is ideal for covering a workspace and protecting it from cuts, scratches, and knicks. Upon inspection, the scratches and knicks will be visible, but will be completely healed. The self-healing cutting mat allows an architect or designer to use rotary cutters and straight knives without risk to the surface underneath. The way a soft surface cutting mat works is that it will absorb any scratches or cuts. Scratches and cuts in the mat will close-up and the mat will heal itself. Self-healing cutting mats are great for use with architectural drawing and drafting. With this mat, architects and designers can cut or draw the perfect angle every time. Professional cutting mats can be ordered in any size needed. Large mats will protect the surface of a desk from damage. 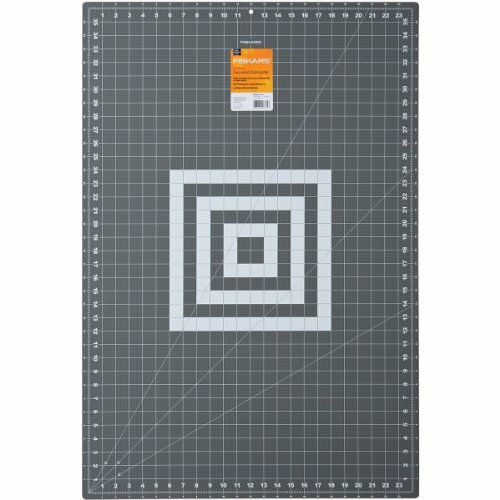 Fiskars 24X36 self-healing rotary cutting mat is extra large and provides lots of space to work on. Cutting mats are designed to last for a long time, and this one will last longer than others. The grid is easy to read and can be turned over for double usage. With 30, 45, and 60-degree bias lines, users will be able to create star and triangle shapes easily. Fiskars self-healing cutting mat provides surface desk protection. Some users have been disappointed with warping and a chemical smell. Warping seems to be avoidable, if the mat is stored completely flat. The Dahle Vantage self-healing cutting mat is extremely durable because of its 3mm, 5-layers of PVC plastic construction. The mat is made with pre-printed ½” grid lines that make it easy to size paper quickly. Scale lines are printed on the mat for easy diagonal cuts. Overall, it appears the Dahle Vantage Self-Healing Cutting Mat provides good value compared to the price. If you want to be able to read the mat easily, users have recommended the blue or clear colored options over the black colored mat. The mat also seems to be more appropriate for light, hobby usage and not for heavy, everyday use. The professional Alvin GBM2436 GBM series 24X36” green/black self-healing cutting mat is made for regular usage. Alvin created the mat with vinyl composite that allows it to heal completely before the next use. Alvin has a great reputation with professionals, crafters, and hobbyists. The vinyl composite mat features self-healing properties that allow it to be used on a regular basis and sustain its integrity. Users can select from 11 different sizes to fit their workspace. But, if you prefer ¼” marks for measuring, you will want to choose a different mat. The Crafty World double-sided rotary cutting mat is extremely durable and easy to use. It features self-healing properties and the availability of sizes make it perfect for a variety of hobbies and professional duties. Due to the color combination (green and yellow), it may not be usable for those with color blindness. The self-healing, rotary cutting mat is advertised for use with quilting and sewing. Unlike other cutting mats, this is advertised as odorless and won’t warp easily. 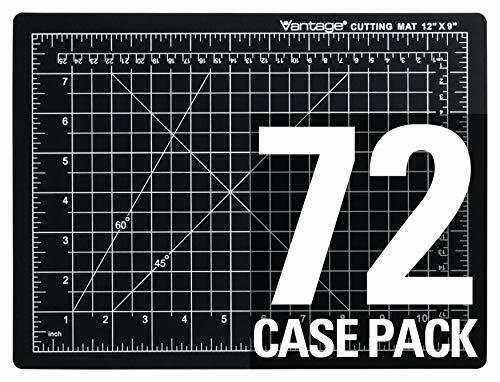 The large mat size makes it perfect for use with many careers including designers, architects, and engineers. Most users had nothing but positive things to say about this self-healing cutting mat. Unlike others on the market, it uses a truly, unique material composition that allows it to heal quickly. I you are a seamstress or designer that often uses curves, you’ll be disappointed to know this mat is not recommended for that type of cutting. The Alvin cutting mat is available in three sizes including the 18X24. It is a professional-grade, self-healing cutting mat made for cutting all sorts of materials. It will fit on any flat surface and can be expected to last for a very long time. Alvin cutting mats are preferred by professionals. The green/black reversible mat can be used for a variety of tasks including cutting, drawing, and designing. The mat has angles that make it easy to cut curves, especially out of fabric. When hung by the convenient storage hole, the cutting mat shouldn’t warp. The Arteza 18X24 cutting mat is a professional grade utensil made for cutting. The self-healing mat provides a non-slip surface, which is ideal or architectural drawing and drafting. It’s a great mat for someone who can cut with confidence. The Fiskars 24×36” Eco Cutting Mat is made or everyday use by professionals. It is easy to read and made of 100% recyclable materials. It’s a large mat that can cover tables and desktops completely. Overall, users have been happy with the Fiskar self-healing cutting mat. The biggest issue is that numbering wears off with pressure. For instance, if you glide your hand across the mat, the markings may begin to wear off. It’s durable and self-heals, but may need to have the lines reinforced for continued use. The Skyhawk Self-Healing 14×14” rotary cutting mat is unique because it provides 360-degrees of rotation. The mat is built onto a swiveling base that allows users to turn the mat without having to move their entire project. It also adds multiple lines including circles, angles, and multiple grid lines. If you want a rotary cutting mat that will self-heal and allows you to swivel the entire project at once, this is the mat for you. If you want a mat that self heals with no signs of use left behind, this may not be the best tool for you. The mat does have a tendency to leave shallow marks after healing, which can bother the future use of tools on the mat. The 12” rotating, self-healing rotary mat rom Olfa is a 2-piece unit that allows you to measure and swivel without moving the project from the board. Olfa is a trusted brand that is used by designers, hobbyists, seamstresses, and more. The rotating, self-healing cutting mat is great for small projects that are completed faster if left on the cutting board during the entirety of the project. The mat should not be used in a location where it will be exposed to direct sunlight. The cutting mat should also always be stored flat, or it will become warped and deemed unusable. Whether drafting is one of your regular duties at work, or you need a self-healing surface to protect your desk or tabletop from damage, you can benefit from this type of product. The ten products above each have distinct advantages and disadvantages. It’s important to think about what is important to you and required for tasks that will be completed. It’s also a good idea to have more than one cutting board on hand to tackle complicated tasks or to have a backup in case of unexpected damage.